Texas will face Lipscomb for the NIT championship at 6 p.m. Thursday. TCU goes 0-for-9 during critical second-half stretch and shoots 28.3 percent overall. NEW YORK — There was really no need to come all this way to the “World’s Most Famous Arena.” The Longhorns would’ve played the Horned Frogs again on a blacktop in Waco. Beat somebody bad enough, long enough — as TCU has done to Texas the last three seasons — and it all comes to a boil eventually. The kettle whistle fired Tuesday in the NIT semifinals. It wasn’t a game worthy of the historic venue. These two would get booted out of Rucker Park playing like this. 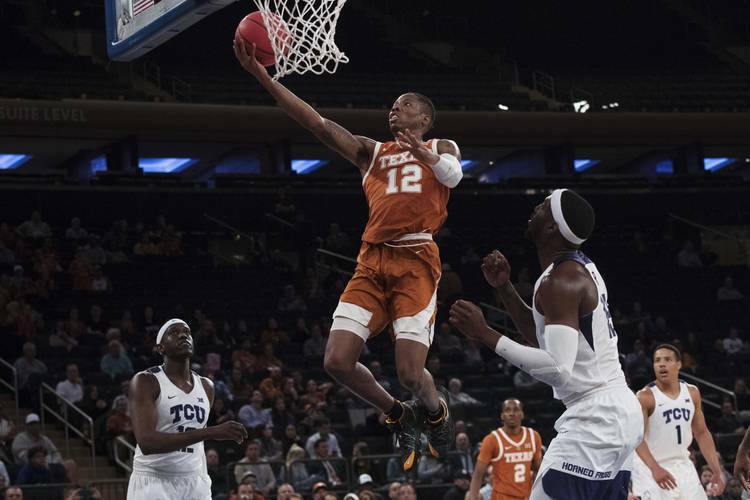 But Texas played suffocating defense, allowed a season-low 17 points in the first half and ultimately captured a 58-44 win at Madison Square Garden. Texas (20-16) has now won four straight postseason games and can win the NIT championship by knocking off Lipscomb at 6 p.m. Thursday. The Horns don’t make it a habit of playing in the NIT, but they’re gunning for their second title in this event. Texas won the NIT in 1978, too. UT actually beat Lipscomb by 23 points in non-conference play last season. The details from what happened on Nov. 18, 2017, are foggy for most, but guard Matt Coleman III remembers one thing clear as day. “Matthews. Just one name. Matthews. I know that for sure,” Coleman said. Lipscomb senior Garrison Matthews went wild for 34 points in a 71-64 win over Wichita State in the other NIT semifinal at the Garden. Matthews can wait. The Longhorns wanted to soak up a rare win over their Big 12 counterparts. Dixon’s club was 5-1 over Texas over the last three seasons. The Frogs (23-14) probably thought they could punk the Horns again with little to no retribution. TCU’s Kevin Samuel posterized Jericho Sims early. The 6-foot-11 redshirt freshman collected himself and went up and over Sims for an incredible dunk. But that actually got Sims going. Minutes later, Samuel tried it again. This time, Sims snuffed it out. Not only that, but Sims went to the other end and scored himself, giving Texas an early six-point lead. TCU’s Desmond Bane had 34 points at the Erwin Center, an embarrassing total for the home team. This time, it took Bane 9 minutes, 31 seconds to score at all. He had only four points in the first half and finished with a ho-hum, harmless 11. “We just wanted to force him into tough shots,” UT’s Dylan Osetkowski said. “We didn’t want to give him anything in transition. The Longhorns actually made things tougher on themselves with botched layup attempts and some missed dunk opportunities. The two teams started the second half making only three of 14 baskets combined. At times, it was borderline unwatchable basketball — if defense isn’t your thing. Still, all those missed chances are OK as long as you are strangling the other team. Coleman drew two charges, Roach drew another one and no Frog ever really got going. Texas watched its 15-point lead melt down to five with 11:24 remaining. But this time, the Horns applied a tourniquet. Osetkowski hit Roach cutting backdoor for a nice layup. On the next possession, Ramey and Osetkowski worked a little two-man game that led to another basket. Osetkowski (13 points) scored again in the paint, and Texas’ lead was back to 11. While all this was happening, TCU was in the midst of an 0-for-9 shooting slump. Coleman’s 3-pointer and Osetkowski’s trey with 2:25 remaining practically sealed the deal. The Frogs shot 28.3 percent overall. Next story: Malcolm Epps has emerged this spring, but can Texas find him playing time during the fall?